A former Japanese video game designer and creator of one of the most popular arcade games of all time, Pac-Man, he was born in the Meguro ward of Tokyo, Japan. He joined the computer software company Namco in 1977, where he started his career in the video game business. There, he came up with the idea for a game called "Puck-Man" and in 1980, he, along with programmer Shigeo Funaki, a hardware engineer, a cabinet maker and composer, Toshio Kai for sound and music, finished the game. It was released to the Japanese public on May 22 of that year, where it became a huge success. It caught the attention of arcade-game manufacturer Midway, who bought the United States rights for the game and released the game in the U.S. as "Pac-Man", for fear that kids might deface a Puck-Man cabinet by changing the 'P' to an 'F'. Due to its innovative concept and continuing international popularity, it is regarded as one of the all-time classic video games. He returned to his Pac-Man roots in 2007 when he developed Pac-Man Championship Edition for the Xbox 360, which he states is the final game he will develop. He went on to create a few other video games, including Libble Rabble, but none of them reached the amount of success that Pac-Man did. He was promoted within the ranks of Namco, eventually being responsible for overseeing the administration of the company. 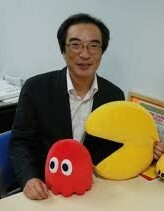 In a VH-1 Game Break interview, he said he did not personally profit from the creation of Pac-Man, saying, "The truth of the matter is, there were no rewards per se for the success of Pac-Man. I was just an employee. There was no change in my salary, no bonus, no official citation of any kind." Since April 2005 he has been teaching the subject of Character Design Studies at Osaka University of Arts as visiting professor. He left Namco in March 2007 to become a full-time lecturer at Tokyo Polytechnic University. On June 3, 2010, at the Festival of Games, he officially received the certificate from Guinness World Records for his game Pac-Man having had the most "coin-operated arcade machines" installed world wide: 293,822. The record was set and recognized in 2005, and mentioned in the Guinness World Records: Gamer's Edition 2008, but finally actually awarded in 2010. On June 2, 2010 just before visiting the Festival of Games, he was photographed showing the original sketches of Pac-Man. This photograph was later published by Dutch developer magazine Control on June 22, 2010, making it the first public appearance of these designs.